I love border punches, but I only own one! :-) First, they are a bit pricey, and I would rather spend the money on Cartridges. Second they take up a lot of space. Third, I have about 20 that I have designed on my Gypsy so I don't actually need to buy them! 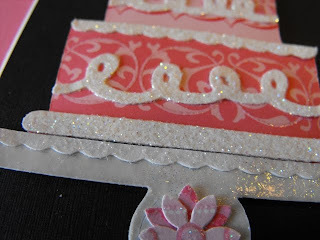 In this video I show you how to design a simple border punch with your Gypsy. 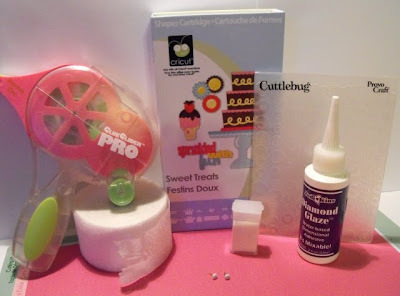 On this project, I used the Sweet Treats Cricut Cartridge, Coredinations Cardstock, Glue Glider Pro, Diamond Glaze, Cuttlebug Spots and Dots embossing folder, glitter, crepe paper, decorative edge scissors, and two white brads. 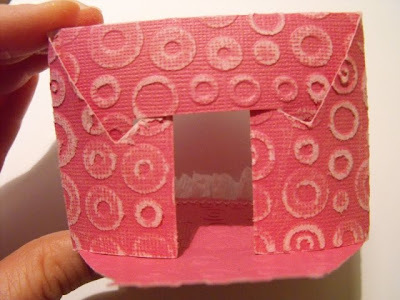 I cut the party favor box (p. 50) from the Sweet Treats cartridge at 3". 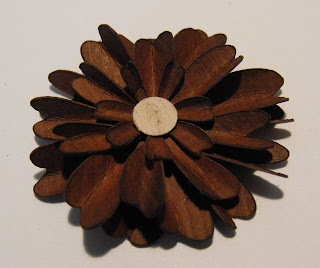 I also cut 2 flowers and 2 flower centers. I only ended up using one of the small circle centers. 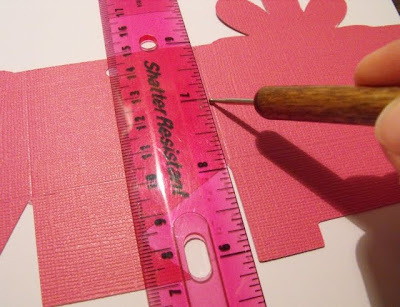 I like to use my ruler and an embossing tool to score the lines. I only wanted the flower on one side of my basket, so I cut the flower off on the back side. 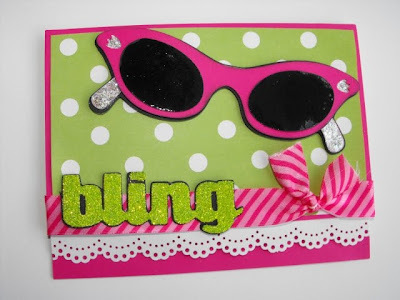 I put this in my Cuttlebug Folder to emboss, doing one half at a time. 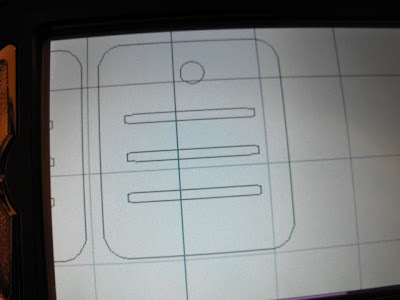 The second half didn't fit, so I tucked the tab underneath before running it through the embossing machine. The fun thing about the Coredinations Cardstock is sanding everything and watching the color come through. 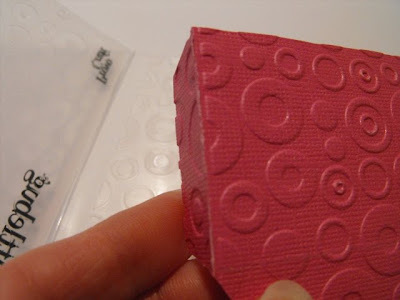 I used sandpaper, but wished very much that I had a Sanding Block! 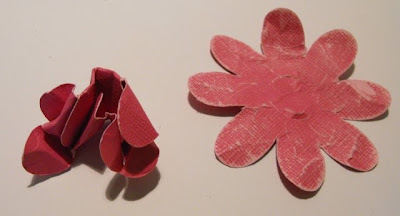 I crumpled both flowers and sanded them as well. 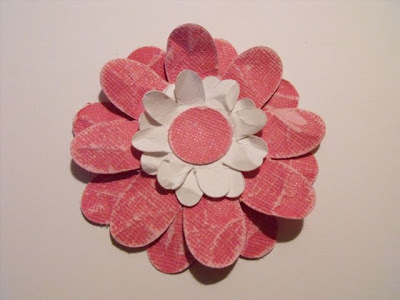 I layered both flowers and both centers and then punched a circle for the very top. 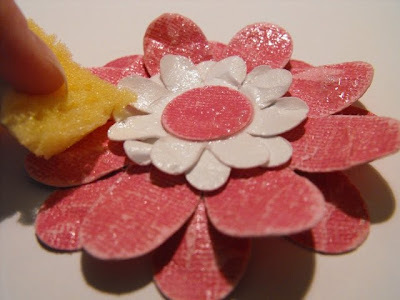 Next, I used a sponge to wipe Diamond Glaze all over the flower. Now may favorite part, the glitter! 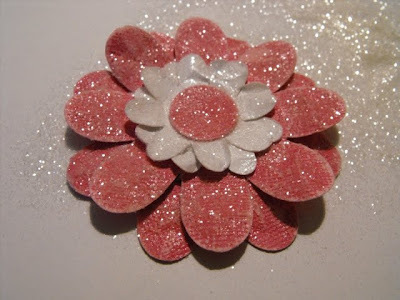 Diamond Glaze works great with glitter! 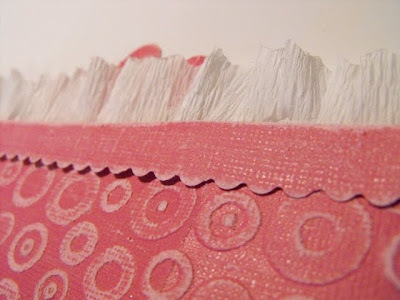 I thought it would be fun to add a frilly border to the top of my basket, so I cut about 24" of crepe paper (the kind you use to decorate for birthday parties) in half with decorative edge scissors. 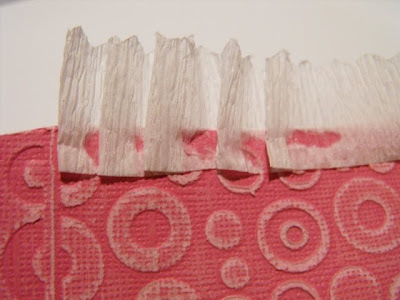 I ran a line of liquid glue down the top edge of my basket and started gathering the crepe paper as I laid it down in the glue. 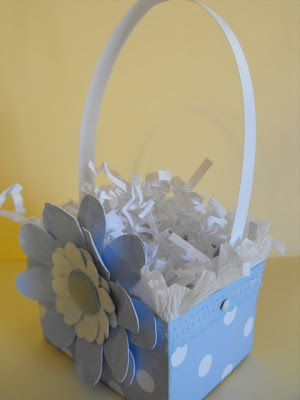 Then I cut a 1/2" by 12" strip of Coredinations Cardstock with decorative edge scissors and sanded it to match the basket. 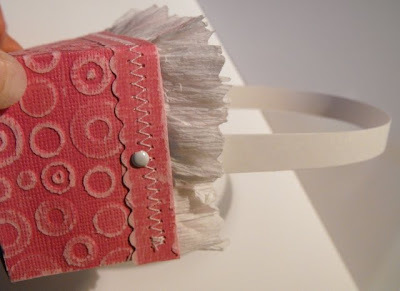 I glued it on top of the crepe paper, matching it up with the top edge of the basket. 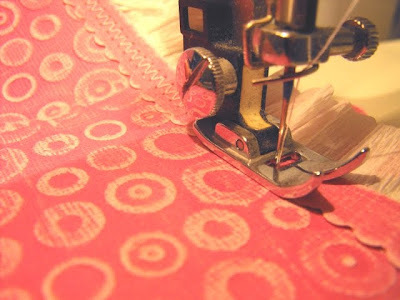 I wanted to dress it up a little more (and make it secure), so I sewed a zig-zag stitch with my sewing machine all along the edge. 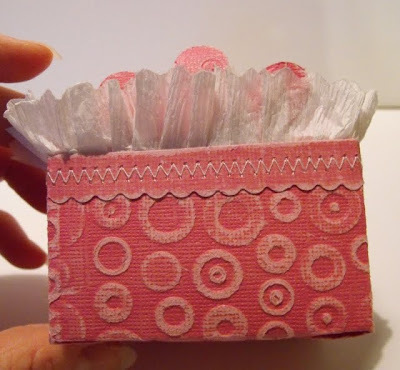 To assemble the basket, fold the top flap down first, then tuck the side flaps into the top. 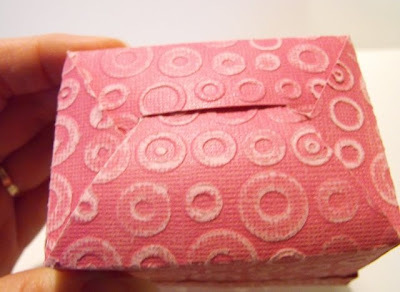 Last, tuck in the bottom flap. 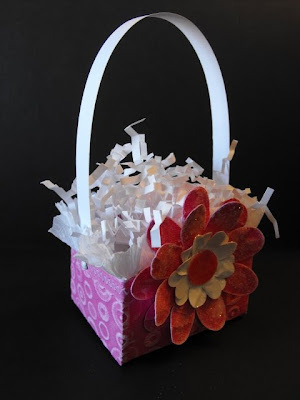 If you are putting anything heavy in the basket, you can secure it with a piece of scotch tape. I also added an 11" by 1/2" strip of white cardstock for the handle and attached it with white brads. 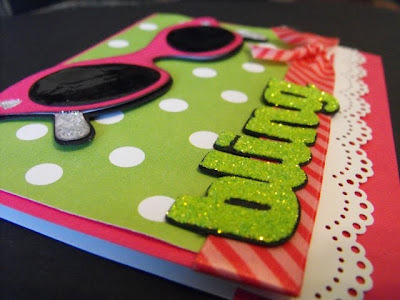 It was so fun to share my pojects with everyone on the Hallmark Ladybugs blog! Thanks again Jody for giving me the opportunity to be a Guest Designer! 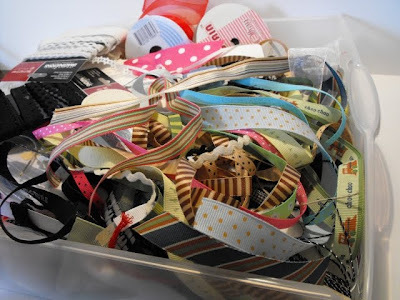 My ribbon storage has just been a drawer and you can see what a mess it had become. I saw an add for a ribbon organizer and thought I could do that with my gypsy! 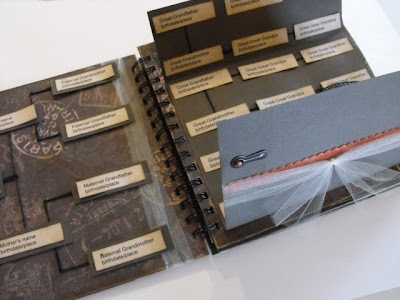 *I used plain cardstock for this project and they seem to be holding up just fine! I used the George cartridge: I selected the square with the rounded edges on p. 111 and then stretched it on the gypsy (width 2.27 x height 2.44). 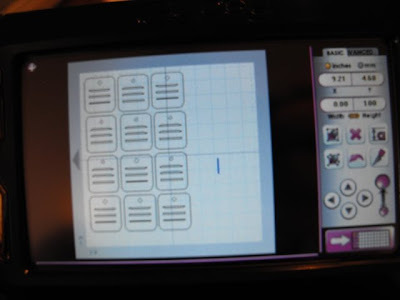 I then used the same square to make the slits (width 1.57 x height 0.10) The little circle is width 0.29x height 0.27. 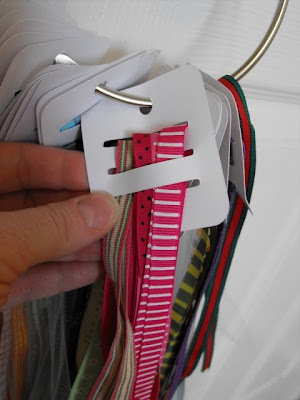 This was super easy and it is so nice to have my ribbon organized! Hi everyone! 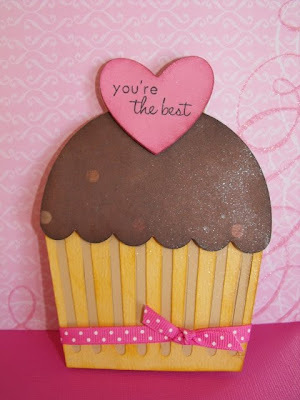 For this card I used the Sweet Treats cartridge, one of my favorites! 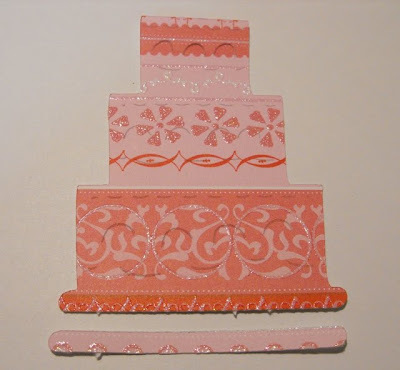 The cake (p. 39) was cut at 2.5" width x 6.5" height and the cake plate (p. 42) was cut at 3.6" width x 4.3" height on my Gypsy. I used the Gypsy so I could size the cake plate to fit the cake. I love my Gypsy! I ran all of the cake embellishments through my Xyron sticker machine upside down, then covered each piece with glitter before adhering to the cake. I used a punch for the flowers on the cake plate. 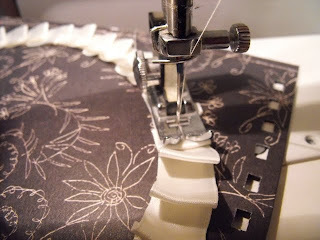 The scalloped border was made with my Gypsy. I turned the letter "D" (Jumbo font) on the Lyrical Letters cartridge sideways and welded a bunch of them onto a long, thin rectangle (from the George cartridge) until it was the right size for my card. Have I mentioned that I love my Gypsy?! 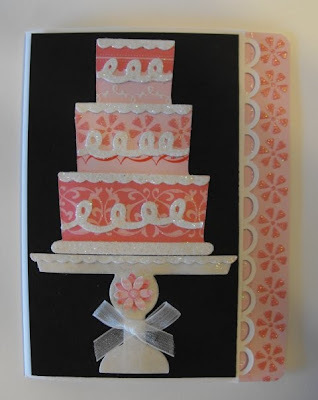 I used a striped patterned paper for my cake. 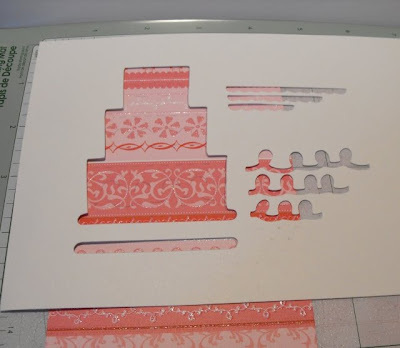 (DCWV cardstock) To get everything to line up, I first cut the cake out on white cardstock. Then I removed the cut out cake, but left the 'stencil' on my mat. 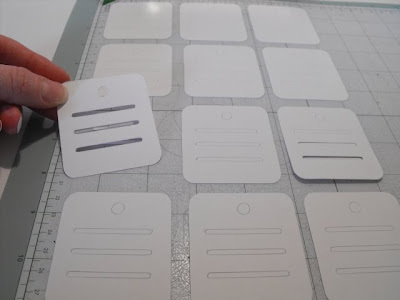 Next, I slid my piece of patterned cardstock in under the 'stencil' until it was lined up just how I wanted it. 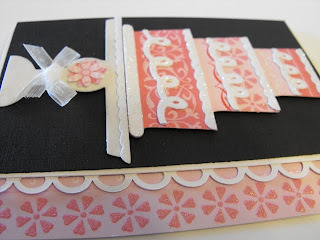 I removed the white before cutting the cake out on the patterned cardstock. 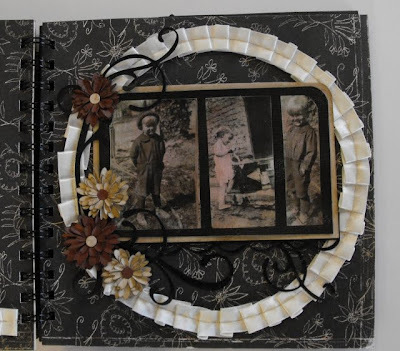 Now I have a cake that looks like I cut it out of a lot of different papers and then pieced them together, but without all of the work! For the cake plate, I wanted it to look glassy, so I used my watermark ink and clear embossing powder. 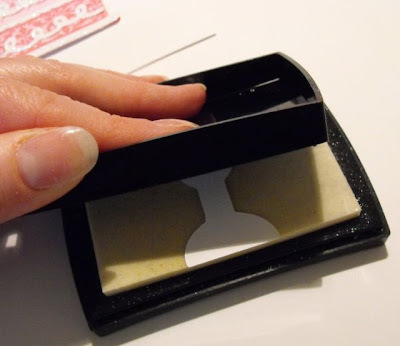 If I have a small piece, like the cake plate, I like to put the whole piece on the ink pad and then use the lid to press down on it. 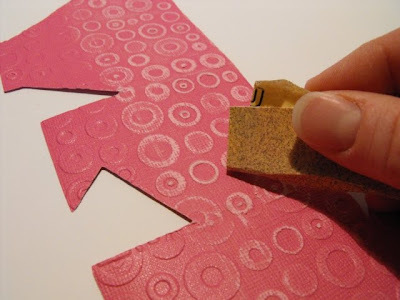 This gives more even coverage than just holding the die-cut and trying to ink it. 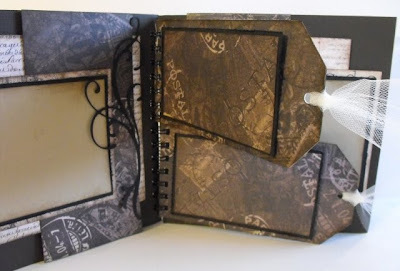 * The gypsy cut file for the tag pages is now available on my blog under the cut files tab at the top. Enjoy! Hi everyone! 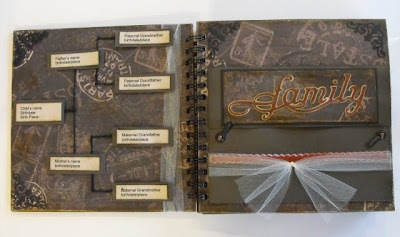 I had so much fun being a guest designer over at Hallmark Scrapbook and appreciated all of your comments! 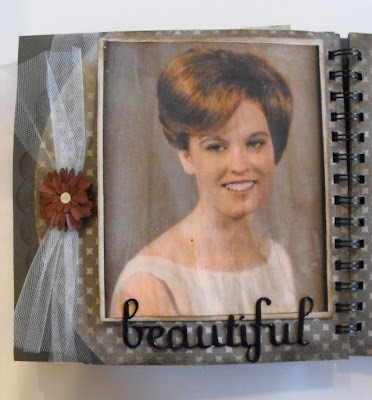 The first project is an 8x8 album that I am making for my Mom. I hope to be getting the Heritage Cartridge soon, and will probably add some more pages. 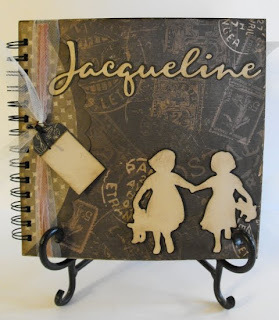 The word 'Jacqueline' was cut using the Gypsy font that comes with the Gypsy. The little girls are cut from A Child's Year at 3 1/2 inches. 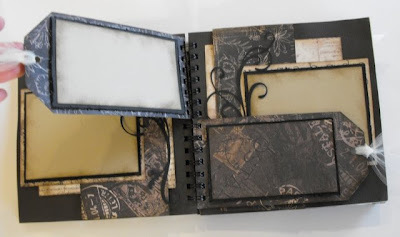 Here are some general instructions for assembling the book: I used the Zutter Bind-it-all, the 8x8 covers, and 3/4" black Owires to make this album. I love my Bind-it-all! I pulled cardstock from my stash (mostly Cratepaper and Fiskars) and cut each page 7 7/8 by 7 7/8. Then I inked all of the edges with Ranger inks. 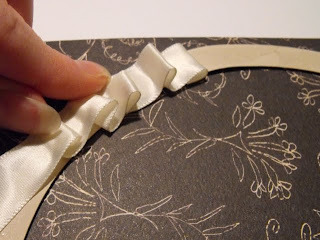 Hint: Do anything that would show through on the back of a page (sewing, brads, etc.) before gluing the pages back to back. Next, I adhered the pages back to back with a liquid glue. After the glue dried, I punched all of the pages with my Bind-it-all. 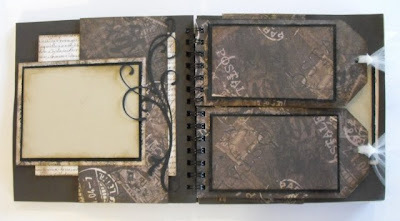 You will want to bind your book before adding thick embellishments to your pages. This page is a pedigee chart. The family envelope opens to reveal names of great grandparents back a few generations. I used brads and photo turns to keep it closed. 'Family' was cut from the Home Accents cartridge on my Gypsy (width 5.6 and height 1.75). I cut the fancy corners from the Sweethearts cartridge (p. 78) at 1 1/2". 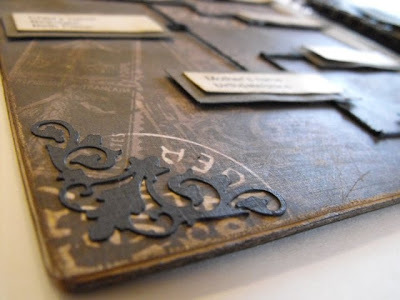 I used thick textured cardstock so I set my cricut to Speed 2, Pressure 5, and Blade depth 6 for this intricate cut. 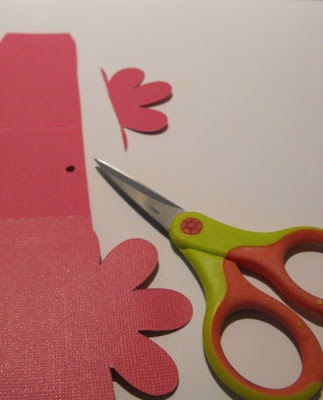 On this page I cut the flourish from Home Decor at 2 1/2 inches. This is my beautiful mother! 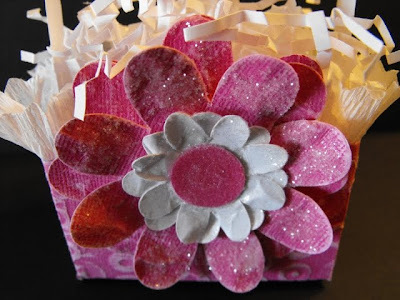 I tied the page with tulle and there is a tutorial for the flower below. 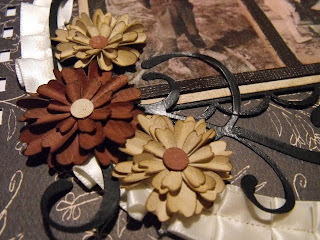 I cut 'Beautiful' from the Home Decor cartridge at 1 1/2" three times and then glued the layers together to make it look like chipboard. Then I coated the letters with Diamond Glaze so they would be shiny and dimensional. I think this is my favorite page in the book. The flourishes were cut at 2 1/2" from Home Decor. I cut two flourishes and then cut one of them apart to add pieces here and there to the first flourish. The border on the bottom of the picture was made on the Gypsy by welding several scallops from Home Accents to a rectangle. 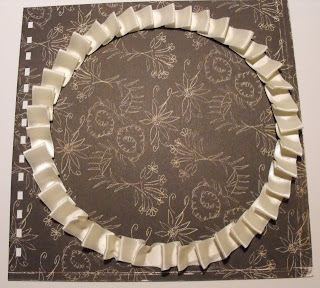 There is a tutorial for the ribbon circle and for the flowers below! 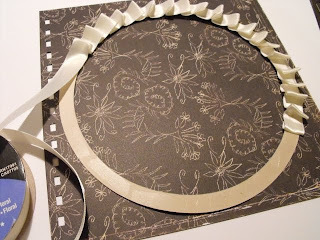 Cut a 7 inch silhouette circle from the George cartridge. 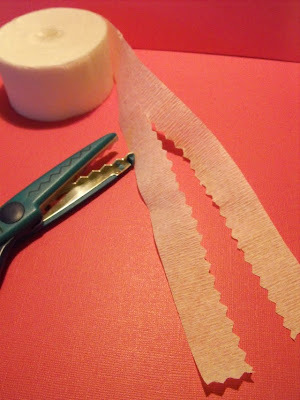 Glue around the entire circle with adhesive and start sticking the ribbon down, pleating it as you go. The flowers were cut from the Sweethearts cartridge. 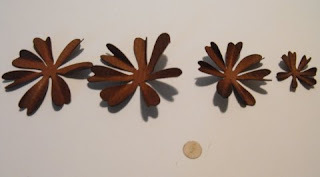 For the large flower, cut two at 1 1/2", one at 1 1/4", and one at 3/4". 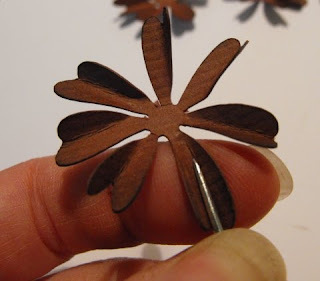 For the smaller flower, cut two at 1 1/4", one at 1 inch, and one at 3/4". I inked all of the flowers with Ranger ink and then curled each petal around a piercing tool. 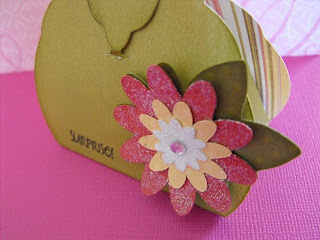 Put a dab of glue (Zig 2-way glue pen) in the center of each flower as you layer them together. 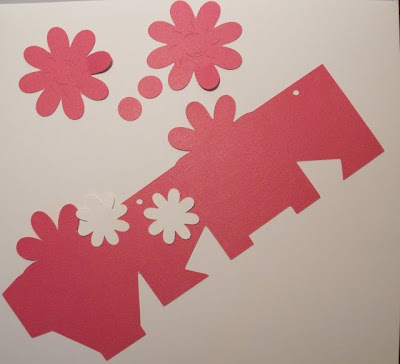 I punched the center for the flower using a standard size hole punch. 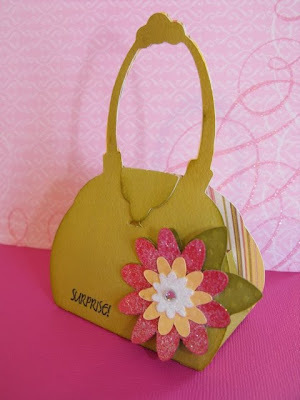 New spring look for my blog!